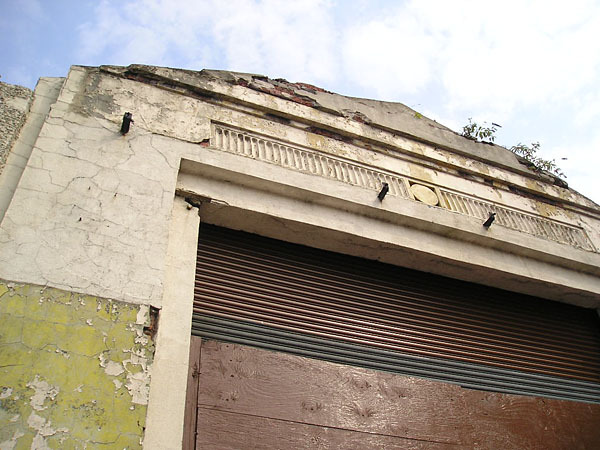 The Press and York Mix have both reported today a press release from the council on the former Airspeed factory building (aka Reynard’s Garage/that old eyesore on Piccadilly/derelict tram shed, etc). It is, to use that rather odd phrase repeated often in the Press, under threat of being ‘torn down’ (as if demolition is undertaken by an angry mob of rioters using their bare hands, rather than being a carefully planned operation tackled in a completely unemotional way, with machinery). Anyone interested in this should probably read the original press release from City of York council: here it is, the factual version, without the inflammatory language. I’ve got nothing much to add, as I’ve written about it many times, for years. I first took a photo of the building in 2004, when I knew nothing about it – the photo at the top of this page. It captured my interest, seemed to illustrate a period in the city’s history, seemed … and I realise this looks daft but I can’t think of any other way to put it … seemed to ‘speak to me’. In a way that many of the city’s more famous bits of heritage never have. Since then it has suffered from an arson attack and from the council not knowing what to do with it, and I’ve written about it many times. I was interested to see the building appear on Twitter recently in a photo by Andy Marshall. He doesn’t live in York, he’s a professional photographer specialising in architecture, and was passing through the city. He didn’t know about the building’s history, but noticed its character, charm, and dilapidated state. It’s interesting that a building like this speaks to some of us and captures our attention, to others it’s just an eyesore and they wonder what all the fuss is about and why it’s still there. If you are interested, there are many pages on this site, tagged ‘Airspeed’. And if you are interested, go and stand by the doorway pictured and look at the bulk of it and the size of the opening and think about what was built inside it and brought out from it, and what that would have been like at the time, how exciting it all was. And then perhaps accept that York isn’t very good with industrial heritage, doesn’t know what to do with it, doesn’t think that its 20th century history is important, unless it’s about chocolate. I am in York today for a conference and noticed this building and wondered what it was. Interesting that it spoke to me, too. I am glad to have found your website and will enjoy reading it long after I have left York.